USDCAD is falling down due to the weak USD and the strong CAD. While there are no economic reports in Canada, the US is releasing ISM Manufacturing PMI data. 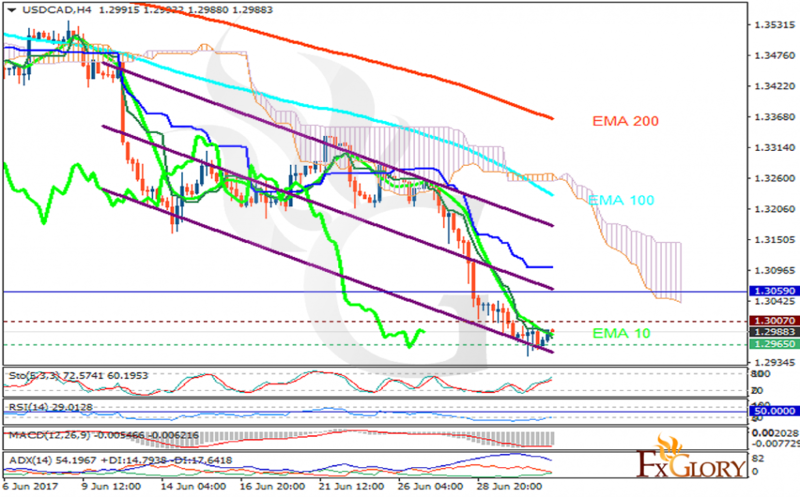 The pair is finding support at 1.29650 with resistance at 1.30070 which both lines are below the weekly pivot point at 1.30590. The EMA of 10 is moving with bearish bias along the descendant channel and it is located below the EMA of 200 and the EMA of 100. The RSI is rising towards the 50 level, the MACD indicator is in negative territory and the Stochastic is showing upward momentum. The ADX is not showing any clear signals. The price is below the Ichimoku Cloud and above the Chinkou Span. The Tenkan-sen is showing a downward trend while the Kijun-sen is showing a horizontal trend. The chart may rise towards 1.30 area but still this pair is under pressure and will drop to lower areas.